The Dénominacion d’Origen Cava was established in 1975 but the production of sparkling wines based on the traditional method goes back to the 19th century when producers got inspired by French winemakers who during the phyloxera crisis came buying white base wines especially in the heart of the Penedès region, around San Sadurni d’Anoia. Though originally a Catalan concept (Cava being the Catalan word for cellar) it soon became a national DO when producers from other parts of Spain successfully challenged the exclusive Catalan character of the DO, claiming they had a similar history in producing sparkling wines. As a result a number of places in amongst others Rioja, Ribera del Duero and Cariñena also got appointed as being part of the DO, though on the total volume they represent a very small percentage. There is one rather unique aspect to the DO Cava: there are no ‘Cava vineyards’. Grapes for Cava production come from vineyards in DO Penedès, DO Alella or DOCa Rioja for that matter, and are declared DO Cava grapes only during the harvest. And though there are specific rules regarding the minimum ageing period for autolysis and the allowed grape varieties, rules regarding for example pressing and harvesting (machine harvesting is allowed) are quite loose, especially when compared to Champagne. According to figures provided by the Consejo Regulador total production in 2017 mounted up to 252 million bottles which makes Cava the second largest producer of traditional method sparkling wine in the world (in volume and value) after Champagne. Compared to 1987 this means a growth of more than 100%, which can be seen as a mayor success for the category. However, with the values of sales being 1.149 million euro, the average price of a bottle of Cava sold is 4,55 €, which is something like 50% below that of a bottle of Champagne. Exports represent 64%, the domestic market for 36%. Sales in Spain outside Catalunya have experienced some problems due to anti-Catalan resentments especially in Madrid. The main export market is Germany with 19% of all exports (in volume), followed by Belgium (18%), the UK (15%) and the US (13%). 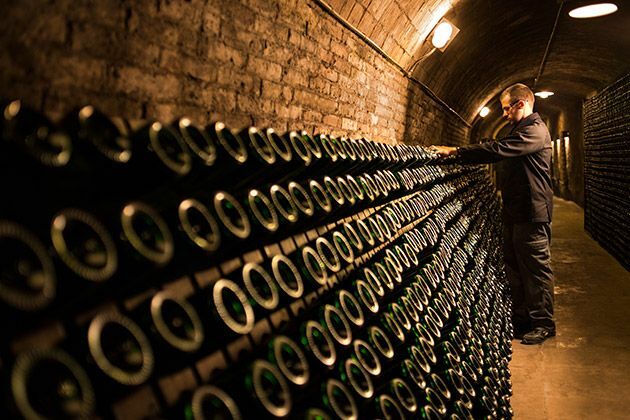 Finally, 87% of all Cava sold is in the standard category, meaning with a minimum of 9 months of ageing in bottle, 11% is Reserva (15 months) and 2% Gran Reserva (30 months). Currently the DO Cava is experiencing problems with some of its members. In a way tjis started already some years ago when leading quality producer Raventos I Blanc decided to leave the DO, pushing for a new DO for wines produced from the original heartland of the Cava DO, around San Sadurni d’Anoia; a move based on discontent about the overall quality of Cava in the market and its image of being cheap and mediocre. A number of other, lesser known producers followed his step, but the new DO never materialized forcing most of them to search for coverage under the hastily created new roof of DO Penedès Classic. Raventos, not really needing shelter, decided to continue life as a non-DO wine. Then, last year a number of other, high quality producers, including big names as Gramona and Recaredo, decided to create an association of high quality producers, again from the area around San Sadurni, called CORPINNAT (a name that combines COR for ‘heart’ and PINNAT for Penedès). Already frowned upon by others, tension rose quickly when they expressed their intention to show the Corpinnat membership on the labels of the wines. The Consejo Regulador soon announced this would not be acceptable, and after a few months of negotiations and growing tension, this finally lead to the 9 Corpinnat members leaving the DO, a decision taken January 30th. The involved producers are Gramona, Recaredo Llopart, Nadal, Sabaté I Coca, Torello, Can Feixes, Julia Bernet and Mas Candi. More information can be found on www.corpinnat.com, though you have to understand Catalan to be able to read it…. Finally it should also be noted that the Cosejo Regulador of Rioja recently announced a new category inside the DOCa: Rioja Espumoso for sparkling wines. This means that most or all producers of Rioja in Rioja will also leave the DO Cava, to be joined my more who will now start producing sparkling wine believing in the potential of this new category.